I know Thanksgiving is passed and all of you are very exciting about Christmas BUT! It’s still November and Pumpkin Spice everything season is not over YET! 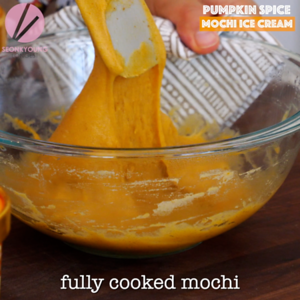 Better late than never, so here is my pumpkin spice mochi ice cream recipe!!! Line cupcake pan with cupcake liners and scoop your favorite ice cream into it. Place in a freezer and freeze at least 2 hours. 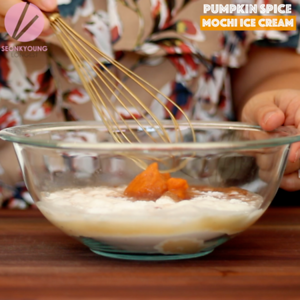 Meanwhile, let’s make pumpkin spice mochi! 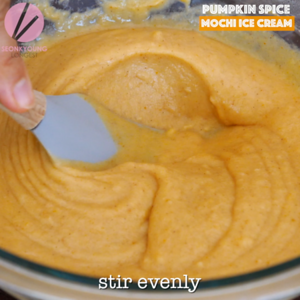 In a medium size mixing bowl, combine mochico, sugar, pumpkin pie spice, pumpkin pure, salt and water. Whisk until there’s no lumps. Mochico is Japanese sweet rice flour, main ingredients for mochi! 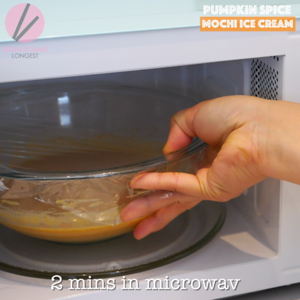 Loosely cover with plastic wrap and microwave for 2 minutes. 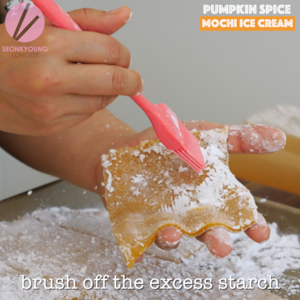 Remove from the microwave and stir until the mochi batter is evenly mixed again. Repeat the process 2 more times, total cooking time is 6 minutes. 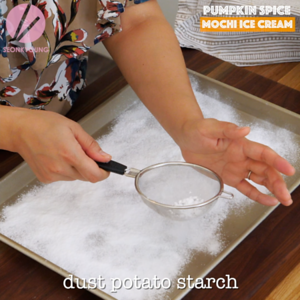 Dust large baking sheet with potato starch evenly and pour the cooked mochi. Dust top of the mochi with potato starch as well. 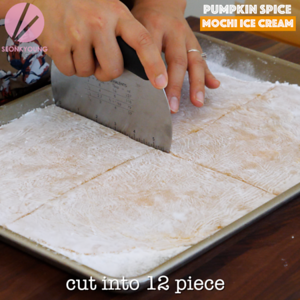 Carefully roll out the mochi into large sheet, the thickness should be between 1/8 to 1/4 inch. 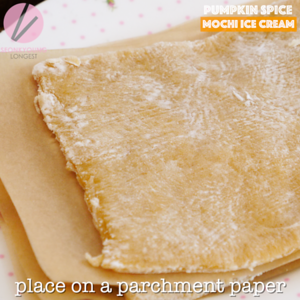 Cut the mochi into square 12 sheets then brush off the excess starch and place on a parchment paper. Repeat until all the mochi pieces are dusted off and cover with plastic wrap to prevent the mochi from drying out. Carefully place a piece of prepared mochi on a piece of plastic wrap. 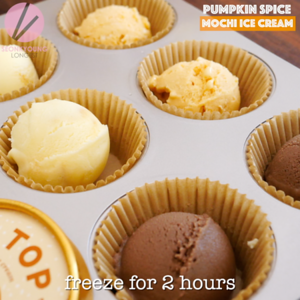 Place a scoop of ice cream on top of mochi, dome side down. 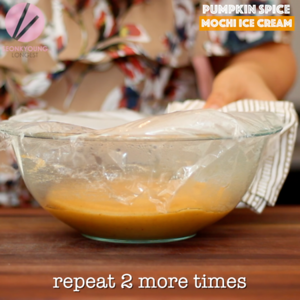 Pinch the mochi edges to seal and loosely seal with plastic wrap and replace in the cupcake pan. 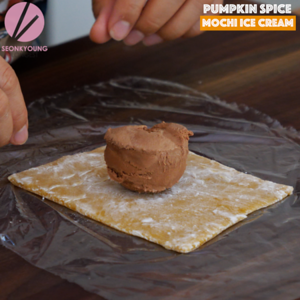 Quickly working on the rest of the ice cream and mochi and freeze the mochi ice cream in the freezer for at least 2 hours before serve. 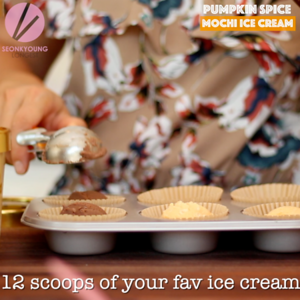 Line cupcake pan with cupcake liners and scoop your favorite ice cream into it. Place in a freezer and freeze at least 2 hours. 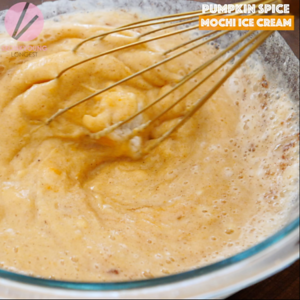 mochico, sugar, pumpkin pie spice, pumpkin pure, salt and water. Whisk until there’s no lumps. 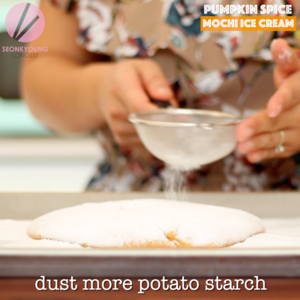 Dust large baking sheet withpotato starch evenly and pour the cooked mochi. Dust top of the mochi with potato starch as well. 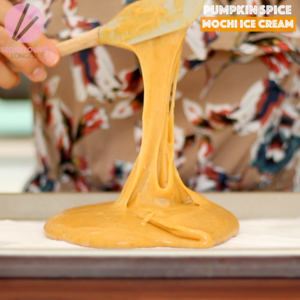 Carefully roll out the mochi into large sheet, the thickness should be between ⅛ to ¼ inch. Any advice on how to make this without using a microwave?